According to the Arthritis Foundation, more than 54 million adults have been diagnosed with arthritis. This painful condition can cause swelling, stiffness, and severe joint pain throughout the body. 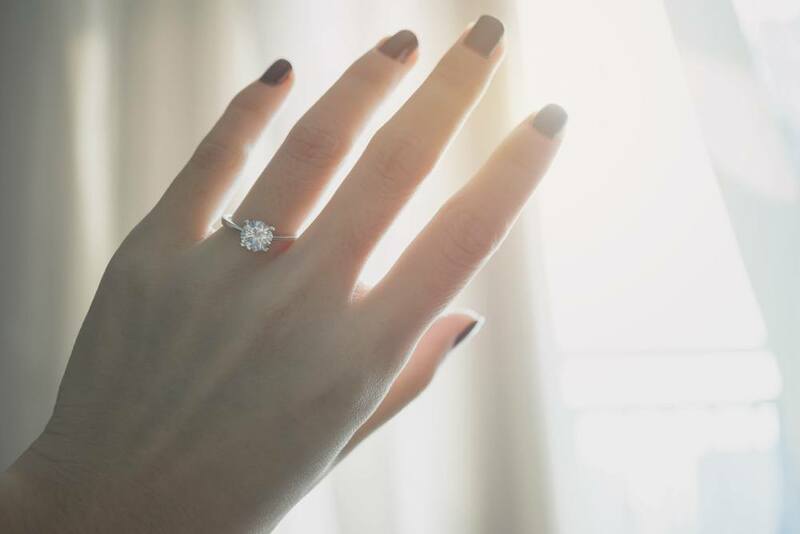 Unfortunately, it can also affect the ability to wear certain pieces of jewelry since many people who suffer from arthritis find it difficult to wear rings. There are multiple joints that work together to make movement of the fingers and hands possible. Arthritis can affect all of these joints, including the knuckles, leading to pain, swelling, a limited range of motion, and stiffness. Some people even develop lumps or nodules on their knuckles as a result of arthritis. Because arthritis causes the knuckles to swell, it’s difficult for people with this condition to wear rings. A ring that fits the base of their finger comfortably is too small to fit over their enlarged knuckle, whereas a ring that fits over the knuckle is too loose once it’s at the base of their finger. This is a frustrating problem that leads many people to give up on wearing their wedding band or engagement ring. No one should have to sacrifice wearing their favorite rings due to their arthritis. Luckily, there are ways to comfortably wear rings even if arthritis has affected the joints in your hands. The solution to this problem is wearing an adjustable ring that can expand to easily slide over swollen joints, but contract to rest comfortably at the base of your ring finger. There are several different types of adjustable rings that are available to adults who suffer from arthritis. One type is designed with a tiny latch on part of the band that swings open when the ring needs to expand. Once the ring is in place, the latch can be closed to return the ring to its normal size. This type of ring has a small latch that is used to expand the size of the ring, but there are also adjustable rings with larger latches. These rings are designed with latches that open up one entire side of the ring to drastically increase the size. To open the latch, simply press a pen, pencil, or other small object into it, and pinch it back together when you’re ready to close it. Even though the latch is large, it is not visible once it has been closed, so no one will know that you’re wearing a ring designed for people with arthritis. Another type of adjustable ring works in a very similar fashion, however it does not feature a latch. Instead, it expands when you pull on the top of the ring. Squeezing the band gently will cause the ring to shrink back down to its original size. This design makes it easy to open and close the ring, so people with arthritis can do it without any help. The newest style of adjustable ring opens and closes using two sliding pieces built into the band. To make room for swollen knuckles, the two pieces slide on the back of the band until they are locked in their fully extended position. This will create more space within the band so the ring will fit over your knuckle. You can quickly return the ring to its original size simply by pinching the two pieces of metal back together. At Brilliance, we do not offer adjustable rings in our catalog, however that does not mean that these rings are unavailable. We are always happy to accommodate special requests for adjustable rings using sizing beads or hinged shanks. Sizing beads are metal balls that are placed on the inside of the band to make the ring smaller. If you are suffering from arthritis, we recommend purchasing a ring that is large enough to fit over your knuckles, and then inserting sizing beads so the ring will stay in place at the base of your finger. Don’t worry about the sizing beads affecting the comfortability of the ring–the beads are so small that you won’t even remember they are there. Brilliance can also use a hinged shank, which is similar to the latch designs described above, to make a ring adjustable. We would be more than happy to make your ring adjustable so you can comfortably wear it even when your knuckles are swollen. If you are in need of an adjustable ring, please let us know so we can accommodate your request and ensure you never have to say goodbye to your favorite rings due to your arthritis.